The Website Dedicated to the One and Only Bill Daily! Welcome to my Bill Daily website!!! Whether you are a fan, like myself, or just curious to find out who he is, I think you will find my site to provide you with plenty of information about the hilarious Bill Daily. If you have tips, comments, complaints, or any Bill information at all, don't hesitate to send it to me!! Just email it to hannah_sos@yahoo.com and be sure to subject the letter as "Bill Daily" that way I am sure to read it!! So go ahead and look around my site to find plenty of "Bill" information! 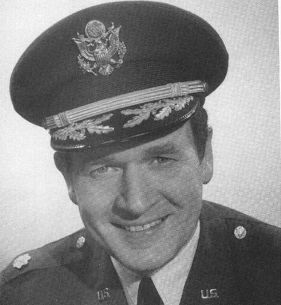 Here above is a picture of Bill Daily dressed in uniform as his I Dream of Jeannie character, Major Roger Healy.